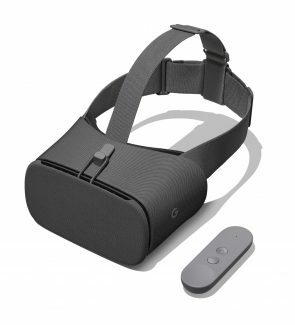 Today at an event in San Francisco, Google revealed the second version of their Daydream View VR headset which makes comfort improvements across the board, including new, custom lenses with a wider field of view. Interestingly, this passive device even makes your phone run faster for VR. 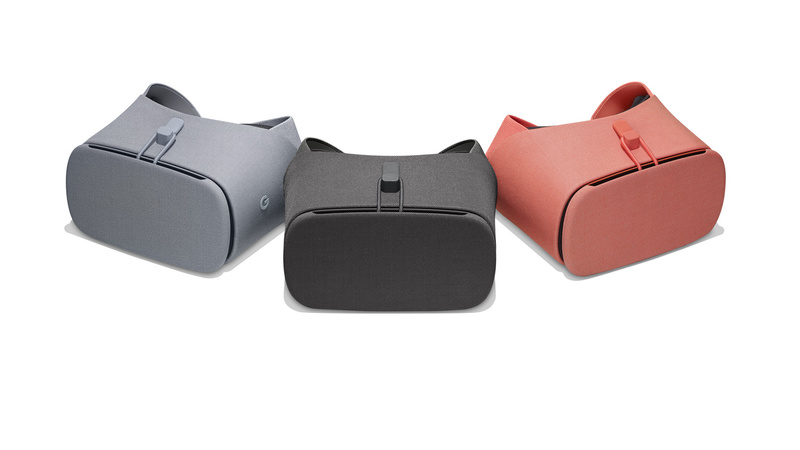 Although Daydream View is a passive device, from the beginning, Google has smartly designed it to do more than just hold your phone. The original device included an NFC chip to automatically detect your phone and launch it into VR mode when you put your phone inside. Capacitive bumpers on the headset allowed the phone to understand its orientation more precisely in relation to the lenses, and align the on screen display to match. Google is continuing its approach to smart, passive design in the new Daydream View headset (FYI they aren’t calling it the Daydream View 2). The new version includes the same NFC chip and capacitive bumpers, but this time there’s a heat sink built into the front flap of the headset which passively cools the phone while it’s in use. What’s particularly cool is that, according to Google, phones actually run faster in the headset than outside of it, thanks to the bolstered heat dissipation. That means the phone can maintain peak VR performance for longer, offering a better, and longer experience overall. 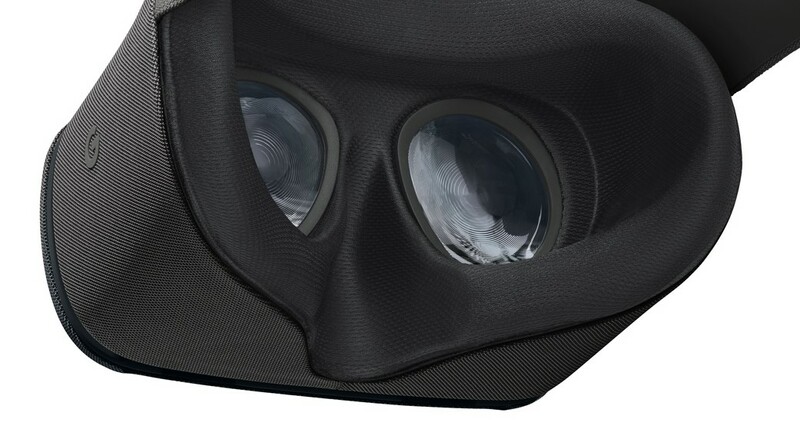 Google says that users will no longer have their VR sessions cut short by overheating issues. On top of the heat sink which brings phones better performance, the 2017 Daydream View bumps the field of view by around 10 degrees thanks to new, custom designed Fresnel lenses. 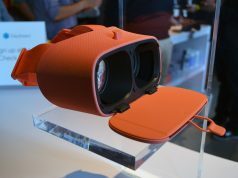 The lenses are notably larger when you actually see them inside the headset, and the view is clearly larger—now closer to what Gear VR offers—than the original Daydream View, which had a rather cramped field of view. Google says they used the immense power of their datacenters to simulate quadrillions of rays passing through various lens designs to find the ideal design. It’s visually subtle, but the design has also seen a complete overhaul, specifically aimed at comfort. First and most obvious: Google has added a top strap to the headset to help better distribute the headset’s weight (it’s also easily removable for people who don’t want it). The facial interface (the foam the rests against your face) has also been made larger and softer. On the original, I found that the foam could create uncomfortable pressure points on my cheeks after long term use; Google says the new facial interface should solve that problem. They also say they’ve had hundreds of differently gendered people test the headset to ensure its fit across a wide swath of head shapes and sizes. The 2017 Daydream View controller is, as far as we can tell, identical to the first. Now it stores away in a loop on the head strap, rather than inside the front cover. 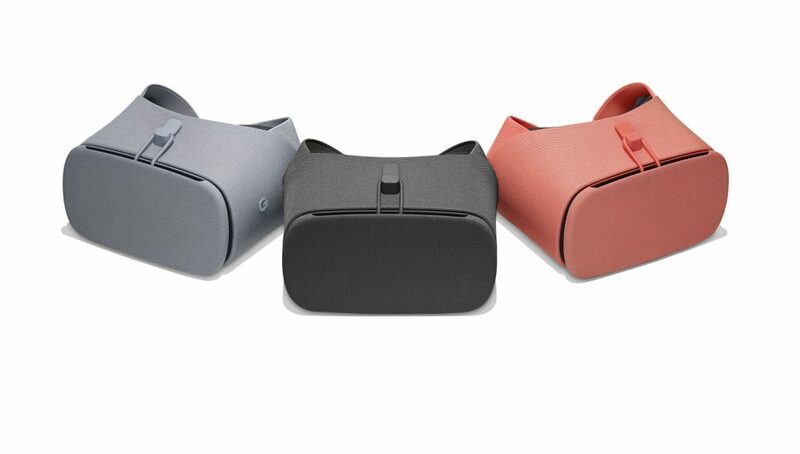 The new Daydream View will be compatible with the same Daydream ready phones as the original (of which Google says there are now 15). It will be available for $100 ($20 more than the original) later this year. 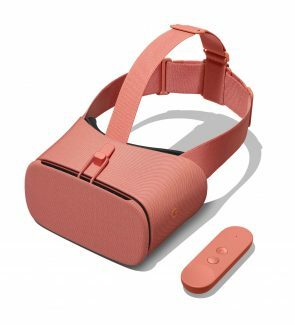 With the hardware inside the Pixel 2 and Pixel 2 XL seemingly identical, is there any benefit from a VR perspective to going with the XL over the non-XL 2? Is it higher ppi or just more pixels due to the bigger screen? A higher ppi would produce a sharper image in VR. While that’s an actual improvement, it’s not something that really sells me on the phone on its own. A bigger FOV for the XL would be a big enough deal for me that I’d probably bite, but it doesn’t sound like that’s going to be the case, and if it’s not a higher ppi then there’s no benefit at all to VR. It’s not more pixels if the 600ppi has the same number of pixels in a bigger screen. it’s the same number of pixels. If the FOV is the same, then you’re seeing the same amount of pixels. The higher ppi, the more magnified they’ll be. I guess there’s just one headset design though. Yes, this. And from what I understand the FOV in the Daydream 2 is the same whether you’re using a Pixel 2 or a Pixel 2 XL, so the only benefit would be if the XL had a greater pixel density, which would reduce the screen door effect. But like I said above, I honestly don’t think that that’s a huge issue, and even less so if there’s not a ton of difference in ppi between these two phones. 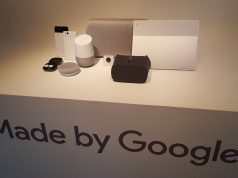 I demo both Pixel and XL with 1st gen Daydream, back to back at Goggle store inside big electrical retailer. Big difference in VR. Chose the XL after the Daydream demo. Quad HD screen and higher PPI. you demo’d the new Pixel 2 or original pixel phones? Oh actually it seems that the Pixel 2 XL is the exact same resolution as original pixel XL. . . . hmmm. Yes, the Pixel 2 XL has a sharper, higher resolution display and a wider field of view thanks to the larger screen. That’s not what I got from the articles that I’ve been reading. From what I can tell the FOV of the Pixel 2 and the Pixel 2 XL in the new Daydream are roughly what you get from the GearVR (I want to say around 95 degrees), which is an improvement over the first gen Daydream due to new lenses, but there’s no difference between the Pixel 2 and the Pixel 2 XL in this regard. The Pixel 2 has a clearly smaller field of view than the Pixel 2 XL when used with the new Daydream View headset. Not only is it visible, Google also confirmed to me that this to be the case. The difference in PPI between the 2 and the 2 XL is also visibly apparent. With the 2 XL, the field of view is definitely closer to Gear VR, but maybe not quite matching (I’ll wait to do a side-by-side before making a bet on that). I have the same question as Mosben: SHould I get the Pixel 2 XL to get a better VR experience (higher resolution)? The Pixel 2 is only HD while the XL2 is QHD I believe. . which should be better resolution than the Rift. Just wondering if it can take advantage of that whole big long screen or you only see part of it. Honestly, I’m pretty disappointed that this generation didn’t have inside out tracking. I currently have the Galaxy S6, which I chose mostly so that I could get a GearVR when it first came out. 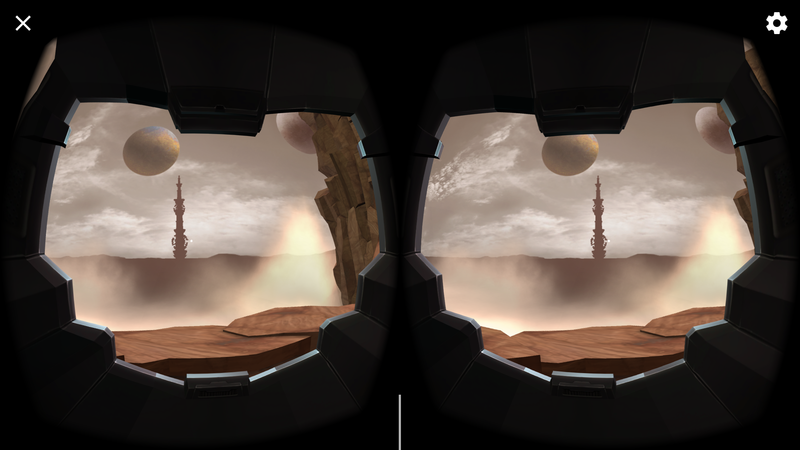 I figured that 2 generations later would see a pretty significant upgrade in mobile VR capability, but it’s actually pretty much the same today as it was 2 years ago with the only significant addition being the inclusion of really rudimentary controllers. Of course, in the meantime I’ve purchased a Rift and am enjoying it enough that I don’t really feel like I can go backwards. I’m probably going to get either the Pixel 2 or the Pixel 2 XL because my wife wants us to switch to Google Fi, but it’d be nice to know if there’s any real benefit between the two phones that justifies the added expense of the XL. Getting a Pixel is a bad idea overall, unless it’s for the slightly cheaper price. well I need a new phone and I use all the Google services. Also I’d like to try their VR. Unlimited cloud storage of photos and video and “free” google smart speaker. . seems like not a terrible deal. Depends on how you ponder deals, this could be a specific match for your expectations but in strict specs, capacity and durability terms I doubt that, especially with Galaxy S8, LG V30 and lots of other Android phone easily outweighing it in value for the price. We asked Google about using ARCore’s tracking capabilities for VR headtracking. They’re experimented with it, but said the time isn’t quite right to bring those technologies together, but admitted that it’s a logical next step. The issues preventing it from making sense right now are likely a combination of tracking precision/accuracy/consistency, and the computational overhead needed to run that sort of tracking. It looks like you can also use it as a hand bag. My girlfriend would be confused. A good thing I won’t be getting one. They went the Microsoft way -> they used 4 years old tech and sell it a premium prices. Did the first DayDream, sold it within a few months.It was super uncomfortable. Your choice of fitting was either loose, saggy and unclear, or shaper, while highly painful to the cheeks. This topped off with the Pixel turning into a furnace and it was goodbye. Sold it on eBay. The original Gear VR was even better. Not taking this route again..
I’m new to the VR world and I have purchased this latest Daydream View that I am using together with my Pixel XL. 1) I’m not dissapointed with the current resolution that nowadays flagships bring to the non-standalone VR devices such as this, but I strongly believe that standalone VR devices should mount 4k displays because of the 360º view itself. 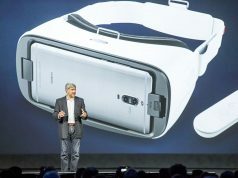 It’s not logical to build 4k displays on smartphones, so the future of VR is standalone, no doubt. 2) As I said before, I’m currently using Pixel XL on the new Daydream while I wait for my Pixel 2 XL to arrive: will it be a better experience at all? I know it’s 6″ but the Mura/screen door effects are quite threatening to me. What do you think?